Our design for Nike Communications can be read as stepping into a living library of Mid-century modern classics. We qualify with “living” because the space feels very fresh and of the moment while maintaining an embrace of modern classics. It is a pleasant surprise when a new client turns out to be a Mid-century design maven who brings so much appreciation for design product and process to the table. The project became a delightful exploration of layering up Nike Communications’ president and founder, Nina Kaminer’s, existing collection of classic pieces with contemporary designers drawing inspiration from the Bauhaus. We sourced an early George Nelson bench for Herman Miller and then paired it with Eric Trine’s Rod + Weave Chair. Noguchi Pendants hang alongside Bouroullec Aim Fixtures. If you know design, walking into this office triggers a checklist of the greats: Le Corbusier, Mies van der Rohe, Prouve, Jacobsen, Saarinen, Wegner, Adnet, and Eames. The gang's all here, but it’s executed in a way that still feels at ease and extremely welcoming. As a communications agency specializing in the marketing of luxury and prestige brands, Nike Communications wanted its space to reflect its collective lifestyle as a purveyor of luxury goods and refined taste. Naturally, the Mid-century classics set a particular tone that is not only familiar and comfortable but also situated in an awareness of masterful refinement. We enjoyed designing to the company’s passions. Cork kitchen stools are a clever nod to our client’s involvement in the wine and spirits sector. A custom wine wall solved a practical storage need while showcasing the various brands in our client’s family of accounts. 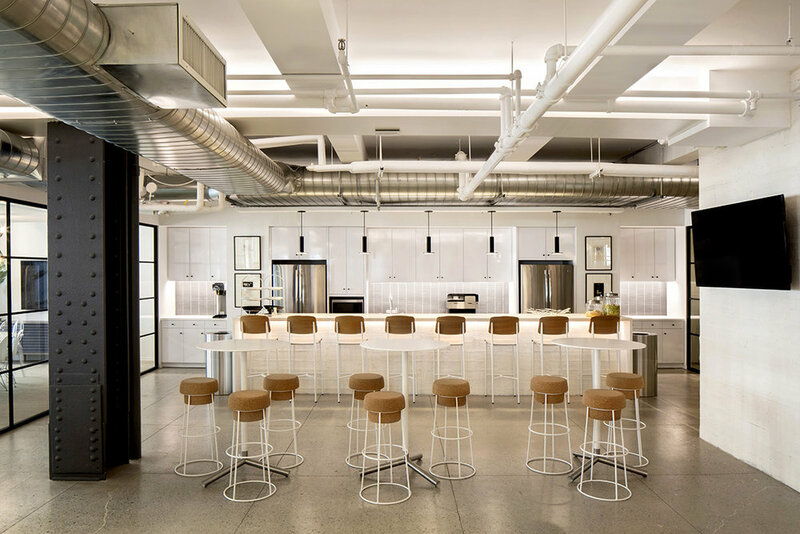 To complete the project, a monochromatic palette leveraged the natural light to maximize a bright and light workplace. In addition to the tonal neutral colors, we deployed a black and white contrast of elements to keep the space feeling crisp and clean. 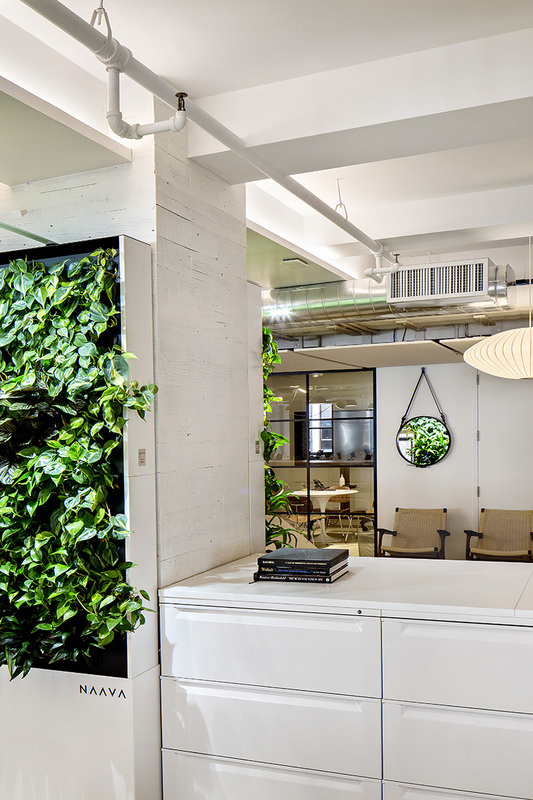 Finally, we layered in living greenery and two green walls to foster a healthy workplace.